You should take a moment to think about the key question related to choosing winter tyres – studded or non-studded? And while considering your options, bear in mind the following questions: How much do you drive in the winter? What sorts of roads do you use? What are you like as a driver, and do you have a lot of winter experience? Can you sometimes use public transport, or do you always need your own car? Is your car equipped with special safety accessories (stability and traction control, ABS brakes)? We will give you a few pointers to simplify the choice between studded and non-studded tyres. 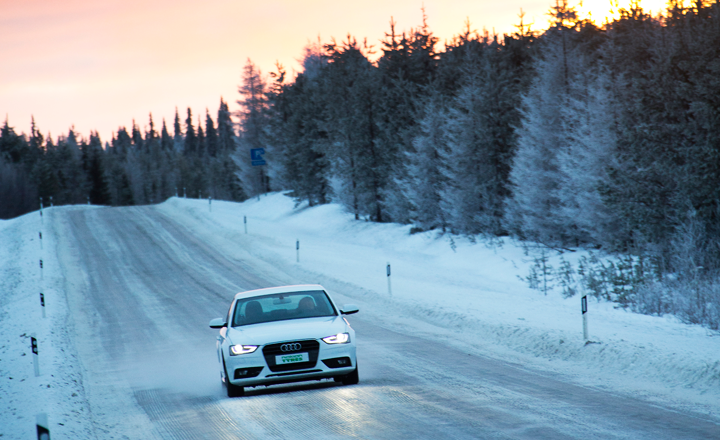 And whichever you pick, bear in mind that winter driving takes skill. A predictable and calm driving style, the correct speed, and relaxed schedules improve the safety and comfort of winter driving. If you drive more on icy roads than on snowy ones in winter, studded tyres are the choice for you. Studded tyres are especially suitable if you live near the coast, where roads tend to be icy during the winter. Non-studded winter tyres are a good choice for snowy roads. If you have non-studded winter tyres, you need to be particularly careful at crossroads etc. where there may be wet ice or hard-packed snow. Studded tyres are superior to non-studded winter tyres on wet ice and hard-packed snow. If you appreciate tyres that are quiet on bare roads, non-studded winter tyres are the right choice for you. Non-studded winter tyres can be mounted earlier in the autumn than studded tyres. Once you have mounted non-studded winter tyres, you don't need to worry about rapidly changing road conditions in autumn. Non-studded winter tyres are also a good choice in spring, when temperature changes can be surprisingly rapid. Non-studded winter tyres all-year round? Coarse spring roads can be particularly wearing on all tyres and non-studded winter tyres are primarily designed and intended for winter use. Non-studded winter tyres that have been unevenly worn by coarse spring roads are no match for good summer tyres. Therefore we do not recommend the use of non-studded winter tyres as all-season tyres. Summer tyres are the safest and most economic choice for summer driving.